Experience ultimate convenience and comfort on the water in our zip front waders. Stealth front zip waders feature a full-length front zipper and are made of the same lightweight and durable 4-layer nylon fabric, with seams double reinforced. The front zippered pockets are highly water resistant and an ideal storage place for fly boxes. Self-fabric gravel guards with a quick-drain panel keep you moving. Easy adjusting wader for a comfortable fit. 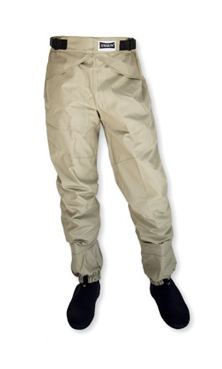 Fish anywhere with these lightweight breathable fishing hip waders. Stealth hip waders pack down, pack in, and provide great comfort—the perfect waders for fishing, travel, warm-weather, and low-water fishing. Super lightweight, flexible, and comfortable, yet rugged; and pack down to save space and weight. Comfortable feet means more time on the water. With these Neoprene Guard Socks you can wear your regular wading shoes while wet wading with the comfort and security you expect. 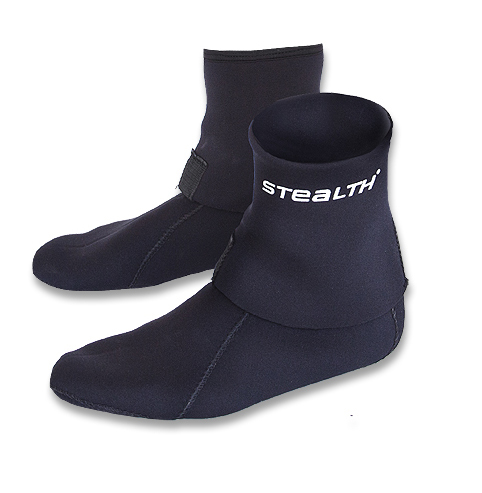 Anatomical sculpted wading socks of 2.5mm neoprene give maximum comfort on the river. Reinforced boot lace hooks for secure attachment. Integrated gravel guard keeps out debris and gravel. Washable.